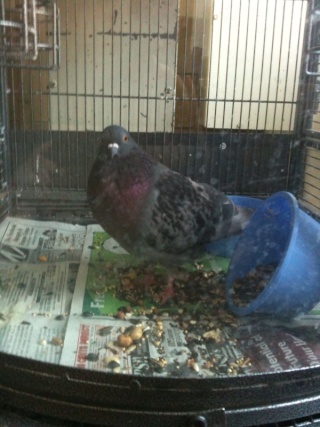 This past week several pigeons were seized in a cruelty/neglect case in Philadelphia, PA, and are now in animal rescue. There are two mated pigeons—one, I believe, is a king—and three unmated blue bars. I don’t have any details about the case, and when I visited the pigeons they all appeared to be fine, although this assessment is based only on a visual inspection, and I’m not an avian vet. IMHO, the two mated pigeons should not be separated, as they are clearly happy together. I’ll provide links below to photos. I am working as a liason to try to get these sweet pigeons fostered or adopted by good people. 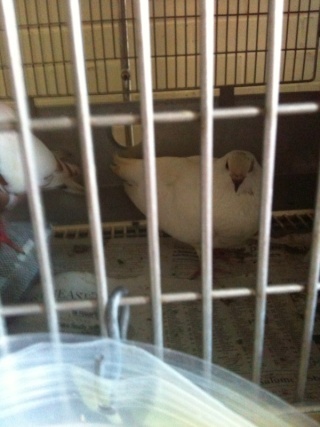 If anyone is interested in adopting or fostering these pigeons, please contact me privately via the list. Also, if anyone is aware of any reputable pigeon foster/rescue organizations in the Philadelphia area, please let me know. PS If anyone wants to send me any other advice/suggestions for these pigeons based on the photos and/or the above, please feel free! If not, you can email them to me and I will post them for you. Nice to see you here. I was just wondering how your summer is going. The links are working for me. Many thanks for helping out with this situation, Dan. I will think positive thoughts that all find wonderful forever homes. Dan... ...the links worked once I logged on to Google. Sorry the earlier pictures didn't link. The first two pictures are the mated pair; the next two pictures are the same pigeon; the final picture is another pigeon. There are a total of three unmated pigeons (in addition to the two mated), and I'll see if I have any pictures of the third (not included in pics below). Thanks, Cindy and Charis, for letting me know about the pics. It looks like they reposted okay. The only things that I notice would be to give them bricks to perch on and water/food dishes that clip on the bars of the cage. That way the birds won't be knocking their food over, getting it poopy and then eating the seed. This would also be a good time to treat them for canker. Does anyone know whether these pigeons are kings? The people at the shelter don't have much experience with pigeons, and I mentioned that these two may be these are kings, but I'm not sure. I'm concerned about them getting adopted by someone who is unaware of how poorly kings fly. Dan from what I can tell neither of the pigeons look like Kings to me, the photos aren't great though. Yeah, the pictures are pretty blurry/dark. I thought one of them might be a king, the one that's all white, but wasn't sure. 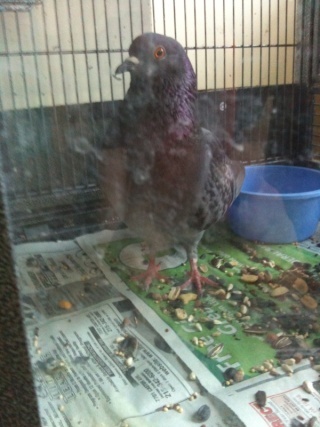 Are the pigeons you think may be kings, as big as Southy? The pied white and pure white are about as big as Southy (450 grams) in terms of weight, maybe a bit less, but the pure white one is slender in shape, like a utility king, and Southy's a fancy king. My uneducated guess is that the pure white is a utility king and the other is a pied white homer, but I could be way off. So there are only 2 ferals? There are a total of five in the shelter, including these two. I reposted these two because I thought they may be kings, in which case I'd be concerned about someone adopting them who doesn't realize that kings aren't very good at flying. 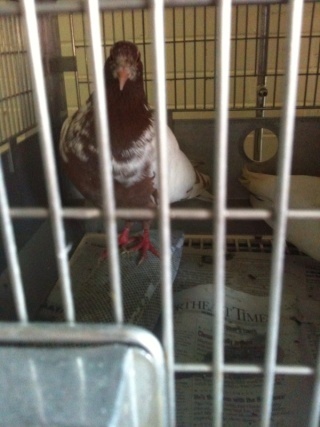 I don't have details about the histories of the pigeons, because they were brought in as seizures in a hoarding case. I'm guessing that they're all ferals, given the location (urban), but that's only a guess. Feral to me is a bird that was taken off the street or the off spring of birds taken off the street....city pigeons. Yes, that's how I also define "feral." I'm guessing now, thanks to everyone's id-input, that they're all non-kings and ferals, although there's no telling how long they were off the streets before being seized in the rescue. The actions you described, including the 'distressed' sounds and the fact she laid eggs, indicate that she has chosen YOU as her life-long mate, and that's her way of showing her affection. And the 'biting', more like nibbling I'd guess, if a request for a fuss and a treat. Still, if you must give her up for adoption, I hope she will find a place where she will be as loved! What a pretty little one, Pigy. As Teresa has mentioned, it does sound like she has chosen you to be her mate. Sending positive thoughts that all works out well. Thank you, that's just adorable. For the past few days, she has been hiding herself inside the newspapers, could this mean that she will lay another egg? I just don't want her to be uncomfortable. Also, when I get her out at random times she presses her body to the ground so I preen her. Do you guys think she's happy in the cage though? The Schuylkill Wildlife Rehabilitation Center? 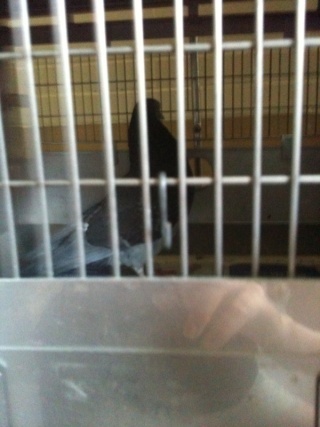 I basically called the place and they said that I could drop her off at anytime and she will be with other pigeons... I am actually kind of scared because while I did read good reviews about the place online, the thought of them eventually releasing the pigeon to the wild gives me discomfort just because of the fact that I don't know if the outside world is for her. Does anyone think it's safe to give her for adoption? Note also, on the first page of this topic, that Feathers111 said he hadn't found a suitable place in Philadelphia to rehome the pigeons he'd rescued. Perhaps you know him...? I suspect that your pigeon doesn't even know that she's a pigeon, but thinks she's a little human being with feathers. 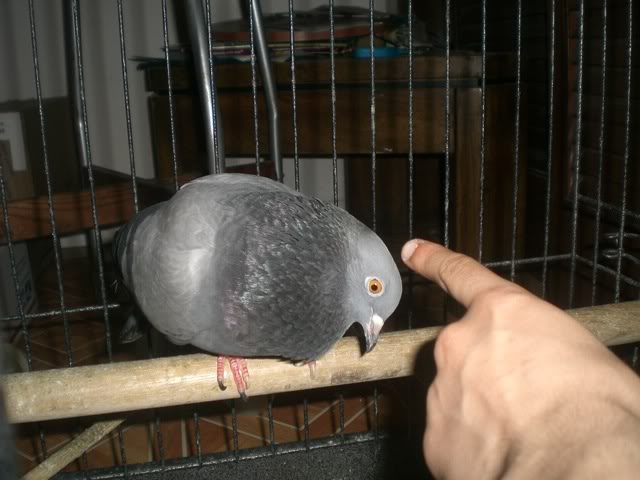 Young pigeons who are hand-reared relate to their carer much more than to other pigeons, and may even be afraid of them. They are said to be human-imprinted. They can learn to live with other pigeons, but the change has to be made quite gradually. Also, they are unable to recognise a threat, say a hawk or a cat, and are very unlikely to survive if released. Her actions, and the simple fact that she's laying eggs (which pigeons only do when they're in love, and not on a regular basis like chickens) clearly indicate that you are her entire world. Parting with you will break her heart, unless it is possible to find her someone who will give her a forever home and care for her on a one-to-one basis. Can you not keep her at all? I know that your post was over a year ago, but I'm wondering if you still have your pigeon? If so, and you are still looking for a good home, I would be willing to give her one. I have had a few pet pigeons over the past 20 years and just recently have adopted a new one who I'd like to have a friend for. I am having a custom coop constructed and it will be ready in just a few weeks. I'm hoping that you were able to keep her and that all is going well with you both, but wanted to offer just in case you still need to find her a good home. (We live about 45 min outside of the city of Philly, in the suburbs, near West Chester and the King of Prussia Mall.) you can email me at kapsiuk@gmail.com if you like.